STEP, the largest entry test preparation network in Pakistan, is well known for the remarkable opportunities it has been providing to the youth. Punjab Group of Colleges founded STEP as a strategical and tactical entry test preparation programme. The mission of STEP was to make entry test preparation easy, handy and accessible to the students. STEP became a very important bridge that students needed to cross the gap between college and professional institutes by clearing the entrance tests. STEP by Punjab Group has been offering entry test preparation classes to the students so they can achieve and excel in the entrance examinations as well by turning the intermediate knowledge into entry test knowledge. The exceptional performances of students over the past few years proved that STEP is offering best teaching resources and preparations systems. Just like its parent organization Punjab Group of Colleges, STEP is also working to reach out to more and more students every day. Accessibility to education is the main mission of the network so the team keeps exploring new ways of providing more and more opportunities to the youth. Punjab Group offers many opportunities to the youth. The network believes that there should be more and efforts made to reach out the deserving students who are hardworking and strive to achieve excellence. There are many types of scholarships and fee concessions being offered at the institutions being run by PGC. The Group also offers incentives to the brilliant students that prove their merit. STEP continuing the legacy of PGC understands the need of students and tries to accommodate them so that they can access the entry test preparation tools to achieve their goals. Now being the largest entry test preparation network STEP is extending opportunities in 70+ cities in Pakistan. The Strategic and Tactical Entry Test Preparation Programme offers many types of scholarships, fee concessions and incentives to its students. Students can win scholarships to study at STEP for their entry test preparation through easy and simple procedure of registering for STEP Self Assessment Test ‘18. The test is free of cost and will be based on ECAT and MDCAT patterns thus, the test will be a free tool of assessment for the students and highest scoring students will be awarded scholarships by STEP. What is STEP Self-Assessment Test ‘18? In 2017, STEP introduced a Self Assessment Test for the students aiming to pursue medical or engineering programmes. All the aspiring doctors and engineers were invited to take this test for free and assess themselves. Through this test students got the chance to see how ready they are for their entrance examinations. The test also turned out to be a means to reach out to as many students as possible since it was conducted absolutely free of cost. 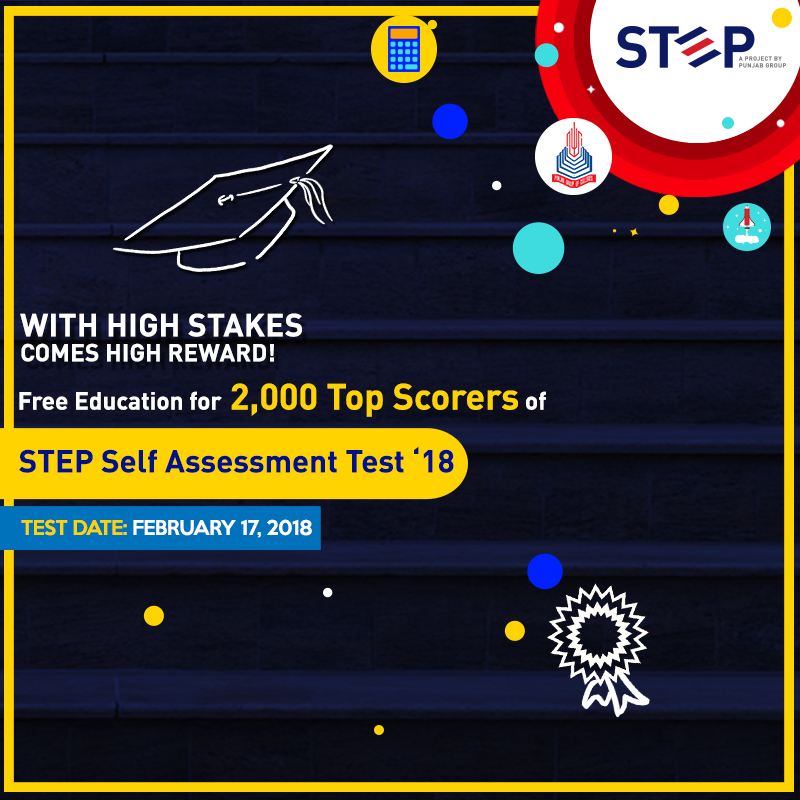 STEP will be awarding Free Education to 2,000 Top Scorers of STEP Self Assessment Test ‘18 (1,200 Medical & Dental and 800 Engineering categories). The STEP Self Assessment Test ‘18 provided the students a chance to not only test themselves for free but also to win a scholarship for entry test preparation in STEP programmes. Students got the opportunity to utilize a free self-assessment tool in the form of this test. A good number of top scoring students were announced to be given merit scholarships in STEP entry test preparation programmes. STEP Self Assessment Test is based on the exact course outline and patterns of the ECAT and MDCAT test. The practice for this test serves as a free tool for entrance test preparation. When you take a Self-evaluation test, you get to see where you stand with your understanding of the concepts and your memory of the knowledge you have retained so far. Entry test is now a mandatory stage to cross in order to be admitted into a professional degree programme at any institute. To clear an entrance test with a goof score to make it to your dream profession is now evident because the stakes are much higher than before. Register for Free ECAT Practice Test & MDCAT Practice Test at STEP! After the brilliant success in 2017, STEP is now conducting STEP Self Assessment Test ‘18. STEP invites the aspiring Doctors and Engineers to take the STEP Self Assessment Test’18 and see how prepared they are for the biggest exam of their lives. Entry test is now a mandatory tool of measuring intelligence of a student and the merit of a student’s academic excellence is also very much dependent on this test. Thus, STEP Self Assessment Test ’18 becomes very important on its own. First it is a free entry test preparation opportunity and then it is a road to success as it allows students to polish their skills and study on scholarship at STEP, the best entry test preparation network in Pakistan. Now is the time for students to sign up at STEP and register to appear in the STEP Self Assessment Test’18. The stakes are higher and the competition is increasing every year. Attempt the Self Assessment Questions in our Test and learn about your readiness before time. A Free and Open To All Test! STEP has paved way for 2,000 students by announcing FREE EDUCATION for the Top Scorers in STEP Self Assessment Test ’18. This means that 1,200 students competing in MDCAT practice test for Medical and Dental Colleges Admission and 800 students competing in ECAT for Engineering University Admission appearing in the test will be able to avail 100% fee concession to study their respective entry test courses at STEP. The grand STEP Self Assessment Test’18 is set to be conducted all over the country at the STEP campuses on the 17th of February 2018. Students who want to avail this once in a lifetime opportunity should hurry up and register themselves at their nearest PGC Campus before: 15th Feb, 2018. Take this free MDCAT/MCAT practice test & ECAT practice test by registering at Punjab College or call at 0800 78608 for more information. All students of intermediate 2nd year aspiring to appear in Medical and Dental College Admission Test (MDCAT) or Engineering College Admission Test (ECAT) are eligible to appear in STEP Self Assessment Test’18.